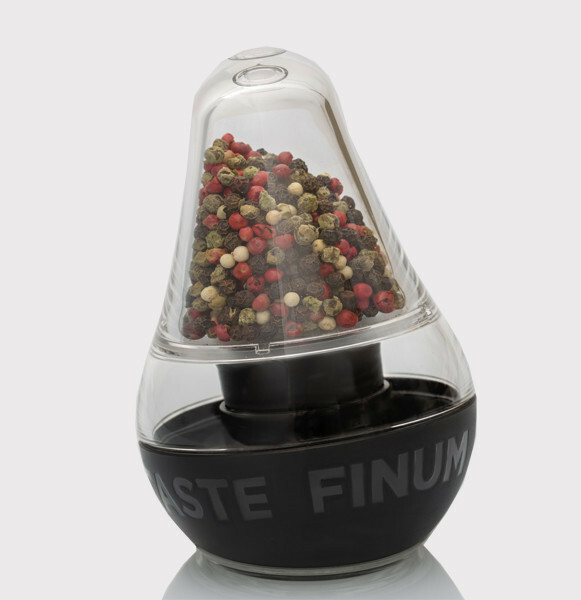 An innovation in tabletop: finumÂ´s latest product, LOOK TOUCH TASTE is a patented spice grinder carrying the curvy shape of a bell. At its bottom there is a patented discharge pool which gathers the ground spices within. By tapping it, you can direct the desired amount of spices precisely where you want it! With an elegant outer design that attracts the eye, LOOK TOUCH TASTE is so much more. It includes a ceramic grinder mechanism that has passed a durability test equal to 200 years usage in a normal household. Salt, pepper or herbs can be grinded with no risk of oxidization or any other chemical reaction affecting aroma or flavor. LOOK TOUCH TASTE adjusts the coarseness of your grinding.